Initial Coin Offerings (ICOs) are on top of a hype cycle. They have had attracted a lot of attention even before Telegram finished their $1.7 billion ICO funding and EOS collected $ 4 billion to build a network aiming to compete with the second largest cryptocurrency Ethereum. In total, cryptocurrencies now have a market capitalisation of over $ 250 billions. This underlines that ICOs have proven to be a valuable new funding method especially for early stage tech projects. In fact, as the numbers show, ICO funding has recently overtaken the traditional Angel & Seed Venture Capital business. In the first quarter of 2018, ICOs raised over $ 6 billion from investors compared to a volume of $ 2 billion of early stage venture capital. On the contrary, the total number of ICOs is low compared to the number of early stage venture capital rounds. 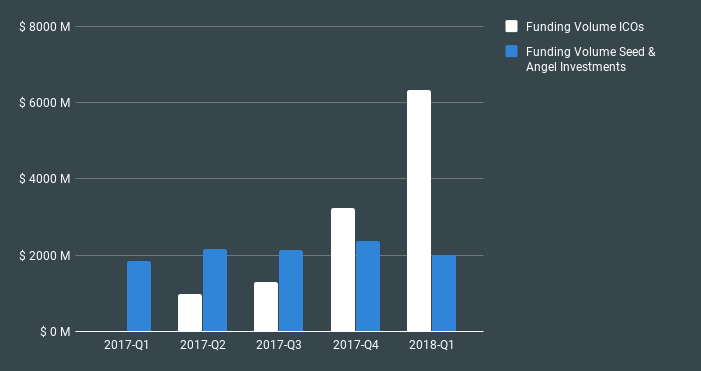 In the first quarter of 2018 202 ICOs have ended whereas about 2000 companies have raised money for their seed round. This is to some extent caused by the fact that ICO funding is more suitable for blockchain based tech projects. In addition, not all founders may be aware of that funding method or consider it as an option. Less companies raising funds with ICOs and a higher volume of funding consequently means that the average amount of money a company raises during an ICO is much higher than the amount they could collect with a seed financing round. Why are companies able to receive such a high level of funding through an ICO? Obviously, the number of investors participating in an ICO is much higher. Whereas a traditional seed round normally incorporates 3–5 investors, during an ICO 10,000 to 100,000 investors participate. This is a direct result of the fact that investing in ICOs is much easier than investing in a seed round. Investment costs are lower and investments are possible with a lower minimum investment amount. In addition, with ICOs investors get a liquid asset that they can trade at any time. Thus, assets are not locked until the company sells more shares in a following round or during a change of ownership event. Despite the tremendous success of ICOs in early stage funding, the innovative funding method cannot compete with the overall venture capital landscape so far. 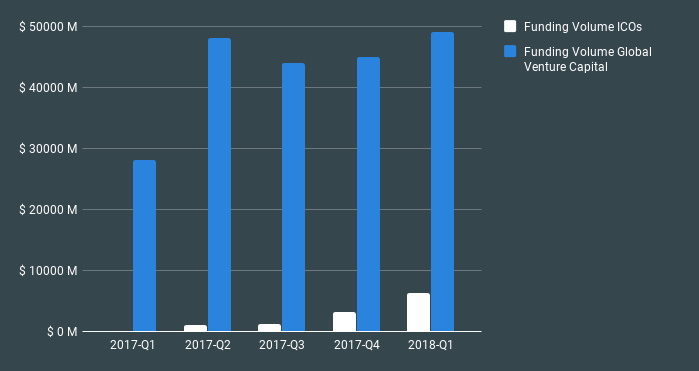 Although ICOs seem to catch up fast, at the moment they account for only around 10% of the global venture capital funding volume. An important reason for this is that the majority of funding flows into later stage companies. However, it is likely that in the next years we will see more ICO funded companies raising money in a second or third ICO. Thus, ICO funding could then as well flow into later stage companies. It remains to be seen if large venture capital funds will step into the crypto landscape by adopting a new way of funding. The highly speculative nature of current ICOs and the misalignment of interests between token-holders and shareholders are definitely problems that have to be solved prior to this. The rise of security tokens will for sure accelerate the participation of venture capital firms. In contrast to the majority of the current ICOs, these tokens represent company shares and at the same time take full advantage of the cost efficiencies brought in by distributed ledger technologies like blockchain. Company shares as security tokens are suitable not only for blockchain based companies but across all industries. And on top of that, they are more strictly regulated and thus tend to be less speculative assets than utility tokens issued during ICOs today. When this second wave of disruption will hit the market, traditional venture capital is at risk to become obsolete. Cumbersome and intransparent funding processes should then be stories from the past. CASHLINK is a financial technology company founded in 2016. The company is headquartered in the Fintech hub of Deutsche Börse in Frankfurt am Main. The innovative team has one goal in mind: the digitization of transferable startup shares.